Recommendations about clinical and pathologic diagnosis of dementia with Lewy bodies (DLB) have been recently refined by the DLB Consortium. Substantial new information has been incorporated with increased diagnostic weighting given to molecular imaging biomarkers. 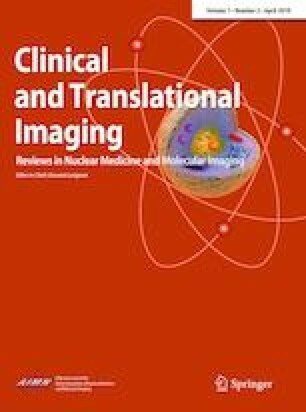 The present work attempted to present a comprehensive evaluation of the role of molecular imaging in the frame of the revised DLB criteria. To this end, we briefly review the molecular imaging tools in the fourth Consensus report of the DLB Consortium, highlighting several indicative and supportive surrogate markers, including I-123 brain dopamine transporter (DaT), I-123 mIBG cardiac norepinephrine transporter (NeT) and brain F-18 fluorodeoxyglucose (FDG) imaging, as the main way to increase accuracy of ante-mortem diagnosis of probable or possible DLB. Along with main neuropathological and clinical issues, we focus on the diagnostic performance and appropriate use of current available items included in the index by nuclear medicine physicians, namely a low DaT uptake, a low NeT expression in myocardial tissue, and reduced parieto-occipital metabolism on brain FDG-PET. Moreover, a critical summary of the current state of the art in pathological validation of other biomarkers including amyloid and tau-PET imaging is provided. DLB Consortium clearly states that clinical diagnosis in clinical routine is suboptimal and gives more weight to molecular imaging biomarkers to offer a more objective information. Along with DaT, mIBG and FDG techniques, brain PET with more specific radiotracers could open a new scenario for an accurate evaluation of biomarkers involved in DLB. The author declares no conflicts of interest; this paper does not contain results of studies performed by the author.